This post concerns a phenomenon I have dubbed exposure trolling. Exposure trolling is the use of blatant & deliberate acts to antagonize, offend & infuriate black people for the sole purpose of gaining clicks, views, trending & monetary gain via social media. I think it’s important to note where I believe exposure trolling reached it’s official start because while there were previous social media hashtags and tweets that pissed black people off, prior to December 16th, these were for the most part accidental in nature and the result of poor social media & marketing planning. That all changed a few months ago when CNN hosted an on-air forum with law enforcement officers entitled “Police Under Fire” and invited the public to submit questions via twitter using the hashtag #AskACop. As you can imagine this was met by outrage, incredulity and disgust by POC on twitter. While I posted my own slightly snarky and pointed tweets using the hashtag, #AskACop quickly became a trending topic & as a result the telecast of this “forum” gave CNN a 51% increase in viewership from the previous week. “I think especially since when NY Police Department did it, I think those times were in error. There was a time when people were not familiar with social media & not familiar with brands and trends and there were some miscalculations at first. The Cosby meme is likely the last time we’ve seen – since then I do believe they are trolling. They put out #AskACop and what happens? Black people make it trend. Cause we’re obsessed with what the media thinks about us & justifying our POV. Don Lemon is the biggest f*&king troll. All of it pissed me off. As I listened to Rod, his co-host Karen & their guest Sterling of The Gaming and Then Some Podcast continue the discussion, I found that while I completely agreed with Rod’s assessment of CNN’s #AskACop ploy, I hoped that his words about this becoming a trend would not come true. Of course as I sit writing this piece a mere 3 months later, not only was Rod 100% correct, but this behavior has moved from media organization use & has spilled into the realm of acceptable marketing behavior. It is beyond a trend at this point, it has become one more box on the marketing checklist for social media managers or anyone hoping to gain exposure via social media. So as you can see insulting black people has ZERO downside for the content/product creator. They have created & we are actively participating in a cycle where our anger – much like our bodies via slavery & mass incarceration – is being commoditized to great monetary gain. NOTE: I will NOT be linking directly to these sources but do link to articles related to each of the incidents I detail below. 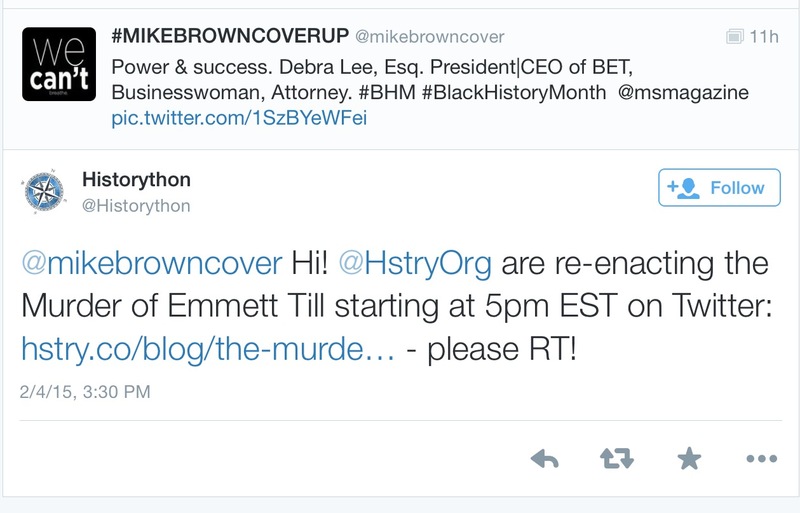 To “honor Black History Month” Hstry, a Belgium based online history website for educators, decided to “Live Tweet” the horrific hate crime that ended in the murder of Emmett Till in 1955. They did this from the POV of Emmett’s Great Uncle in first person narrative (an example: “His response sends shivers down my spine. My wife is still crying, the others in the house are also trembling with fear”). The @Historython account did this for hours leading up the 5PM start time of the “Live Tweet”. They deliberately went after accounts & feeds that would reach black people & voila! Black people saw this, got enraged and took to twitter to make their outrage known. Prior to this incident NO ONE had ever heard of Hstry.org – despite their giving TED Talks, winning all sorts of awards and the like – it was only AFTER they devised a way to use the anger of black people for exposure would that they made it to the “big time” on social media. NOTE: The use of the separate account makes it clear they knew they would be blocked by many of the people who received this tweet & didn’t want their main twitter account blocked. They also have since deleted the over 100 times they sent out this tweet on Feb 4th. An unknown graphics & web design company decided to create a new product and thought it would be a good idea to call it “The Hanging Tree” complete with an offensive image a long oak tree with a noose dangling off it’s largest branch. Immediate outrage from black people on all social media platforms followed. The company doubled down defending it’s choice of image & name going on to direct people who were upset to “contact their legal team”. No one had heard of this company prior to this incident and within hours of posting the offensive image – their mentions, links and exposure shot through the roof. There are many others & as Rod put it perfectly, “this s&*t is going to be the new trend until niggas wake up & stop giving them your eyes.” So what can we do? 1) Don’t take the bait. As my Grandmother used to say, never give fuel to fools. Resist the urge to bring attention to the offensive party. Hold back from retweeting good responses to the offensive item. Instead tweet about Exposure Trolling as a media tool. Call out PR firms, call out marketing teams and make more people aware that their anger, pain & outrage is being used for monetary gain. 2) Focus on positive alternatives. Find alternative black owned companies doing the same work as the offending party and PUSH PUSH PUSH them into the main stream. Let’s get #BlackGraphicDesign trending let’s tag history based educational tools that respect black people & black history. Let’s tag specific police departments and highlight their killing of black people instead of a CNN created hashtag. 3) Create our own narrative. For topics like Black History Month – shape the discussion the way WE want to see it. Check out the Ferguson Action created #BlackFutureMonth where we are called to collectively envision what the world looks like when Black people are free. To imagine a time when future we want is realized, #WhenBlackLivesMatter. to use our individual & collective voices in more constructive and powerful ways.